Box Dimensions (LxWxH) 18.5 x 10.2 x 1.1"
EF 100mm f/2.8 Macro USM Lens is rated 4.8 out of 5 by 840. Rated 4 out of 5 by LifeIsDesign from Lens really helps our product Let me get my one major gripe out of the way, I wish this lens were an L series. My two lesser gripes, I wish it had IS and that the AF was faster. Now with that out of the way, this lens has become the best thing for presenting our product. Especially on our website. The f/2.8 really helps me get the consumers' eye where I want it in the picture. The blurs are great. To make my gripes pointless, Canon doesn't offer a macro L series with IS, so this is, I believe, the best macro lens available. Portraits look great with this lens. All my portraits I take of myself, I take with this lens. Images are super sharp, an above good lens but below great. Rated 5 out of 5 by Painterdude Tom from Buy it now. Discontinued. Great lens. Of course if you are reading this review, you have probably read so many others which laud the lens. I want to add that for the copy work I do (shooting oil paintings), the great advantage is in the flatness of the image and the reduction in glare afforded by the longer focal length. Also, for your reassurance, the MTF chart (no longer available on Canon's site unfortunately - I got a technician to send it to me) shows very consistent focus and little aberration, far better than the 50mm lens I was using. Not as good as an L-series, but competitive performance and far better price. Buy it while they are still available - they are discontinued by Canon. Rated 5 out of 5 by JIN from very sharp lens! This lens is very sharp! Whether you are shooting a macro or portrait, the result is what you are expecting from Canon! the built quality is solid. Although now Canon released a L version of this lens which has IS but if you shoot your object with tripod (which you should if you really want the best macro) then IS isn't important to you. the only L is the weather proofing. If you use this lens indoor or it doesn't expose to any water or rain then you should be fine. The quality between the L and non L are pretty similar. Only if you blow up the pics and the L will show a bit more detail. it won't matter to many of us. for a price like this with the quality, you just can't beat it! Rated 5 out of 5 by Bigdog from SHARP. As usual... Canon does not disappoint. 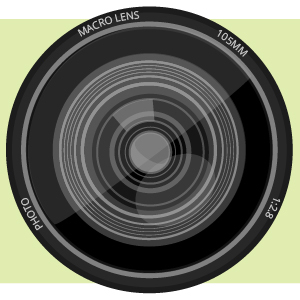 It is quite common for a single focal length lens to be a bit sharper than zoom lens'. This is also the case with this 100mm F/28 lens built by Canon. I've always preached buying the brand lens to match the users camera body. Seems to have always worked well for me. I'm using this lens in my studio and it is very sharp indeed. The autofocus is also very fast and accurate. I've used this lens for about a month now and processed approximately 300 portraits through it and am very pleased with the results. Have also used this lens on two food shoots with tripod and natural light and came out on top. Rated 5 out of 5 by Kiwikat from Excellent Macro Lens For the price, you couldn't ask for more. The lens is solidly built, has decent AF performance in fair and better light conditions, and is TOO sharp. This lens puts my 300mm L to shame as far as sharpness goes. The handling is great, though the focus ring isn't as smooth as that of L lenses. To take advantage of this lens you'll need a sturdy tripod, a nice flash, and a remote shutter control. If you're serious about macro, get this lens over the new L IS version. Use the money you saved for another prime. This is truly the best deal out there right now. It very well may be the most fun/dollar I've had with anything. Rated 5 out of 5 by George from Great Macro/Medium FL Telephoto Lens I am an amateur photographer with about 20 years film and 20 years digital experience. I recently purchased this lens for my new 70D. The bottom line, for the photography I'm interested in I decided that the Image Stabilization (IS) wasn't a necessity so I chose this lens and I very happy with my choice. This is a great value, high quality image, macro photography is outstanding and the auto focus function works extremely well. It feels like a solidly built lens, I'm not concerned with the weight. I highly recommend that you look seriously at this lens for macro and medium telephoto applications where is IS isn't required. Rated 5 out of 5 by Seth D. from 100mm f/2.8 Macro I've had this lens for about a week now, and right out of the box I did some sharpness testing and wow! This is a fantastic lens all around. Wide open it's extremely sharp, so much so that I didn't really notice much of an improvement stopping down. I am using it on a 7d right now, so I'm not sure exactly how the corners fare on a full frame, but so far so good. I think the only reason that you would spring the extra $ for the L version is if you absolutely need IS. To me it's not worth double the price so this is my lens. In terms of sharpness, everything else I've used on a DSLR pales by comparison. If you need a macro GET THIS LENS! Does the efs60mm f/2.8 Macro USM fit on a EOS 5D Mark III camera body? No. The Canon 5D Mark III is not compatible with EF-S Lenses. I don't see Canon EOS 5D Mark II listed under compatible cameras however I was told by a Canon retailer that it would be. What is the correct answer. First question here:What cameras is this compatible with? Answer:The Canon EF 100mm f/2.8 Macro USM Lens is compatible with all current Canon DSLR camera bodies. (APS-C or Full Frame). Can I use this with my Canon 5D Mark II? Correct, the Canon EF 100mm f/2.8 Macro USM Lens is compatible with the 5D mark II as it covers full-frame sensors and uses Canon's EF mount for connection. 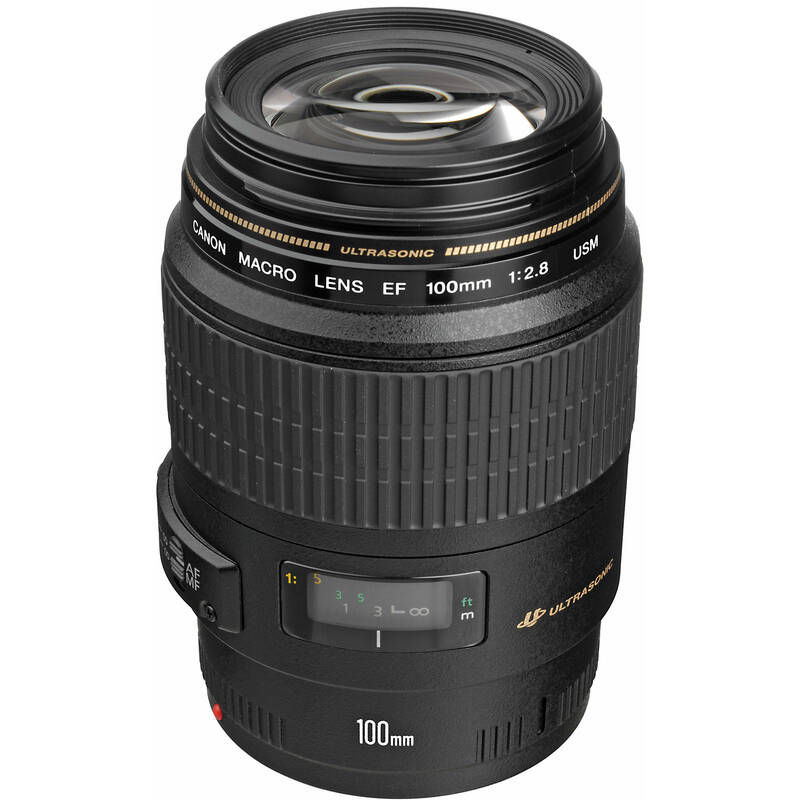 When shooting close-ups with the Canon EF 100mm f/2.8 Macro USM Lens you should stop the lens down to f/16 to f/32. This will give you more depth of field. You should also focus 2/3rd back on your subject. What is the advantage of the focusing limiter feature when there doesn't seem to be much difference in closeup distance of 1' or 1.6'? Both focus to infinity but I can't seem to figure out what the advantage of one is over the other. I've switched between both using AF and MF but don't seem to see how the image is different from the other. If you're using autofocus, it decreases the range that the lens has to focus with to come into focus. You're limiting either on the short or the far side, and because of the broad focusing range that the lens has on its own, it gives you a shorter working distance so as to decrease the battery consumption of the camera. Does the lens aperture stop down as you focus closer? I see the blades get smaller and exposure changes and I focus closer than infinity. Is this normal or a problem with the lens? This is a constant F2.8 lens The aperture will not stop down as you focus closer. Does it work with EOS Rebel SL1? Yes this lens is fully compatible with the Rebel SL1. would this work on a canon rebel? Yes. I have used this lens on several digital Rebels. I've been reading lots of reviews on Macro lenses in the 90-105mm focal length, and I seem to sense that in this focal length range the better it is to look for one with image stabilization. There'll be times when I can use a tripod and not need it, but I like to be able to handhold when I'm out hiking and don't want to lug a tripod with me. I usually stick with Canon lenses since I have an EOS 70D, but I also like affordability. What would be your recommendation between a Sigma macro lens with OS and a Tamron macro with VC in the focal length range I'm interested? I'm pretty sure I want to do more in the macro field as I look for new areas to try and think that I'd feel better about using a designated lens over a close-up lens.